Still reeling from previous trade restrictions, imposed by President Donald Trump in the wake of his decision in May to abandon a 2015 nuclear deal, Iran's economy was hit by yet another shockwave Monday when the U.S. enacted sanctions on the country's energy sector. The Trump administration has claimed that it intended only to harm the government in Tehran with these actions and previous ones targeting various other industries, but Iranians of several walks of life living in the capital have argued that it was the everyday citizen who suffered most. "Today the mood was quite normal, the same as other days, people are the same though they look a bit indifferent to all that, I mean they are neither optimist nor pessimist. At the same time, there is anger towards the government which I don't know where or when it would erupt," Fereshteh Sadeghi, a Tehran-based freelance political analyst, told Newsweek hours before the new sanctions hit on Monday. "The government had to prepare a Plan B in case the JCPOA [the Joint Comprehensive Plan of Action] didn't work or an unexpected event happened. 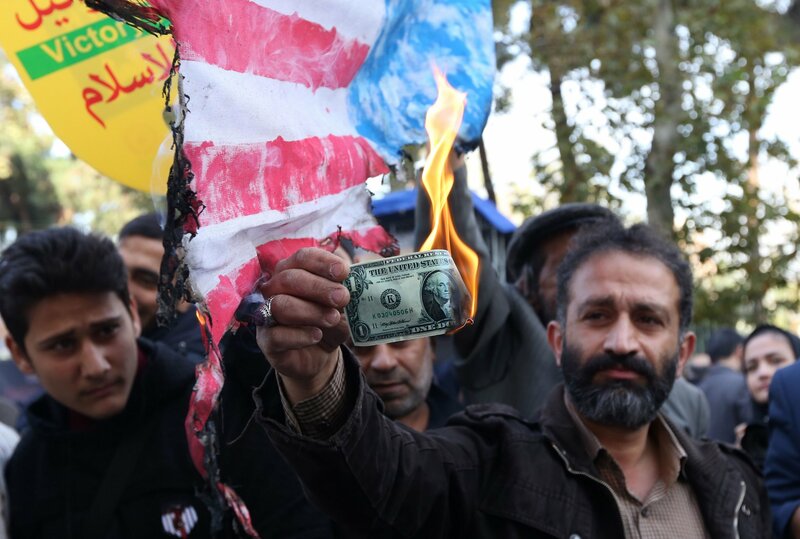 But they didn't, turmoil in the foreign exchange market in the past seven months has also added to people's anger because they see the rial [Iran's currency] losing its value against almost all foreign currencies. Savings in the banks have lost their value, real estate market and rents are going up and every day—I mean literally every single day—the prices of food items, fruits, dairy products, etcetera, is increasing," she added. Sadeghi further explained that "some people have to have a second job to make ends meet and that's for just covering the high cost of living without thinking about leisure or trips so on so forth." She said that poor government oversight and rapid fluctuations in prices have led to shortages as producers and traders could not get the necessary goods from factories. "A friend of mine who works alongside her husband was complaining that their trade has collapsed because they can't buy electronic equipment or spare parts that could have dual-use and even if they manage to buy the problem with banking payment persists because no bank nowhere accepts to work with them. She was saying we are living in the moment and we can't even think or plan for our tomorrow let alone next month," Sadeghi noted. With supply chains interrupted, those who rely on foreign medicine for treatment are particularly concerned. Sadeghi said she knew "a gentleman who was supposed to have heart valve replacement surgery but his operation had been put out because they couldn't find an artificial valve which is bought from abroad." In her opinion, "apart from the U.S. government, most of the blame when it comes to the economy is on our own government—particularly Rouhani's economic policies—because they didn't manage the situation wisely and professionally." Iranian President Hassan Rouhani—who helped forge the Iran nuclear deal alongside his U.S. counterpart President Barack Obama and representatives of China, France, Germany, Russia and the United Kingdom—has struggled to defend the agreement as hardline opposition mounted at home. 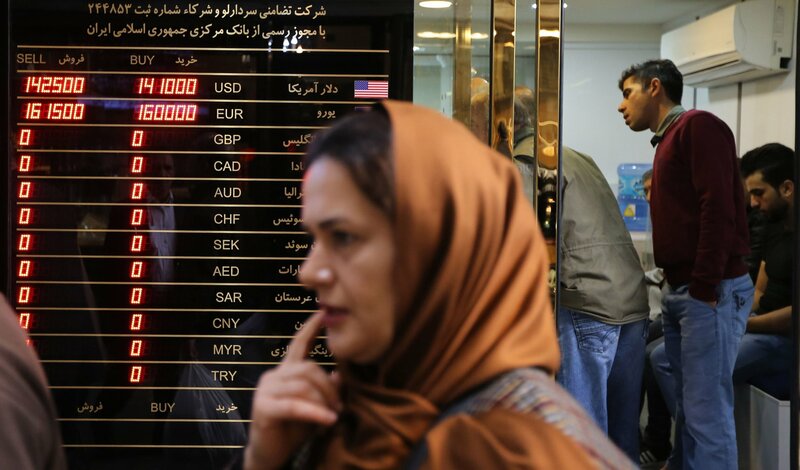 Conservative forces in Iran expressed skepticism toward the accord from the beginning, and the promised prospects of economic booms have been dashed by the U.S. exit and reintroduction of stifling sanctions, throwing the rial into crisis. "The most salient corollary is the severe depreciation of the rial, which has turned my monthly salary into a ridiculous amount compared to what academics receive in other parts of the world," a middle-class academic at a university in Tehran who asked to be identified as Hamid, told Newsweek. "It has also affected my access to academic resources. It’s impossible to buy or order foreign materials from inside Iran." Like Sadeghi, he worried about how the sanctions could affect health care, saying his academic woes "are apart from the destructive impact of sanctions on the supply of basic goods, including medicine." The Trump administration justified its pullout of the nuclear deal and subsequent sanctions by accusing Iran of using sanctions relief provided by the deal to fund militant groups abroad and develop ballistic missiles, though the comprehensive restrictions have threatened to have adverse effects on all incoming goods, including critical humanitarian assistance. State Department special representative for Iran Brian Hook told reporters during a press briefing Friday that the "sanctions regime has very clear exceptions for the sale of food, medicine, and medical devices." When asked how cautious European countries could be assured that they would not trigger U.S. punishment while attempting to deal in humanitarian trade, Hook said that "the burden is not on the United States to identify the safe channels" to conduct such trade, but "on the Iranian regime," leaving potential suppliers in the dark. As Iranians prepared for new hardships, Hamed, a journalist, told Newsweek that "the first round has already bitten hard into the economy." "The dollar has stabilized, but at an exorbitant rate. Before reaching this level, 15,000 tomans, it would go up exponentially, and take staples up with it," he said. "You would wake up every day to an across-the-board price spike, while government megaphones blared in your ear that 'all is good.'" Fellow journalist Ehsan Bodaghi, a parliamentary reporter for the Iran newspaper and an analyst, told Newsweek that "this year, due to economic pressure as a consequence of sanctions and despite rising costs, our salaries were reduced." He then added, "Nowadays even that reduced salary is paid with a two-to-three-month delay, which has adversely affected the personal lives of many journalists. By the way, this isn’t just limited to our newspaper. It’s now the norm in many organizations and companies in Iran." 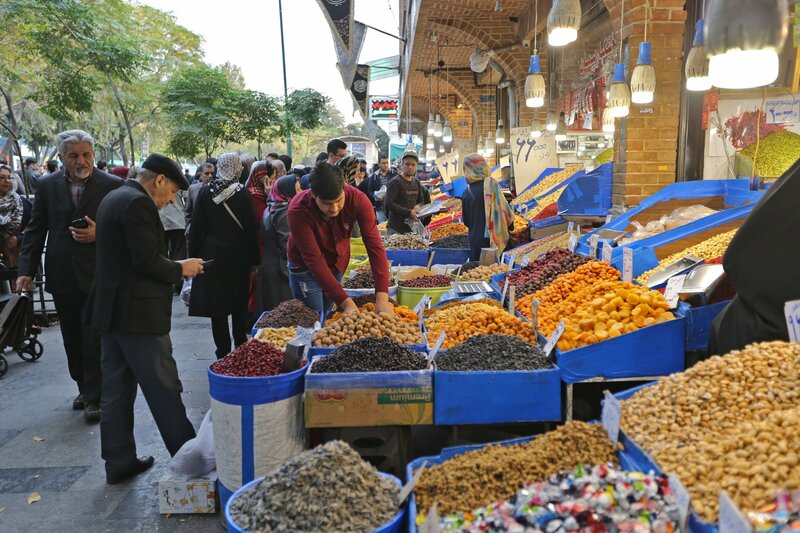 Iranian officials, including supreme leader Ayatollah Ali Khamenei himself, have conceded that the country was undergoing serious economic troubles due to U.S. sanctions. Last week Iranian Foreign Minister Mohammed Javad Zarif told CBS News that such measures "hurt people and we have an obligation as a government to minimize the impact on the people, but sanctions never change policy." While the U.S. has found itself isolated as the deal's other signatories back Iran in the dispute, Zarif's words are a wager considering ongoing demonstrations and general strikes gripping the country from within. "We're a middle-class family, so although the sanctions may have not created a massive problem for us, they have indeed reduced our quality of life," Mahyar, a general practitioner of medicine," told Newsweek. "The most notable effect they’ve had is the reduction of the Internal Rate of Return's worth, which has led to a spike in prices of consumables, gadgets, cars, houses and many more items while salaries have stayed the same, which in turn leads to reduced ability to purchase them," he added. "In my opinion, the sanctions will hurt the people from the middle class and lower classes, while the higher echelons of society are pretty much safe." Mohammad, a civil servant, agreed, telling Newsweek the "people’s food basket has shrunk, except for the profiteers of sanctions." Meanwhile, other parts of Iranian society nationwide are facing the repercussions of the political feud between their country and the U.S. in many different ways, some which have garnered more attention than others. Maysam Behravesh, a doctoral candidate and affiliated researcher at the Department of Political Science at Sweden's Lund University, highlighted the "great deal of collateral damage on ordinary people" that U.S. sanctions inflict, including the aforementioned scarcity and rising prices of crucial medicines. He argued, however, "this has been widely reported" as compared to the crisis now facing young Iranians. "What remains mostly neglected though is the effects sanctions have on the efforts of Iranian youth such as students or more broadly the middle classes to interact with the outside world," Behravesh told Newsweek, citing specifically the new obstacles for Iranian students trying to order books or study abroad. "This is why sanctions alone as an instrument of foreign policy are usually counterproductive: in fact, they weaken the very forces they are meant to empower," he added. "Sociopolitically, sanctions for many Iranians are a harbinger of betrayal: already abandoned by their own government and now further betrayed and crushed by the outside world."